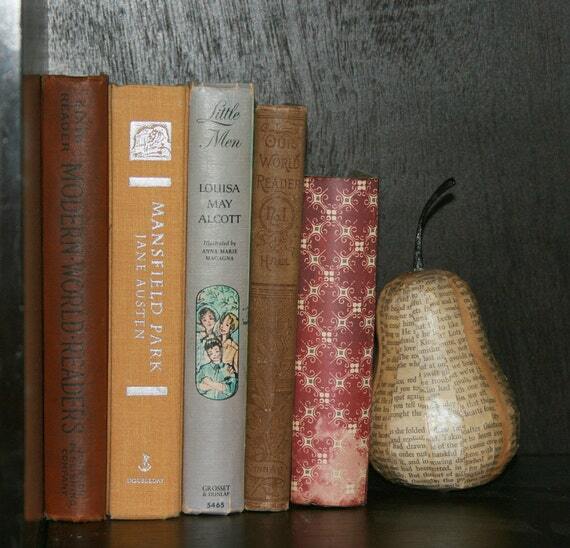 Dare I admit that my paper mache' sculptures are sometimes dollar bin finds from Michaels? Of course! 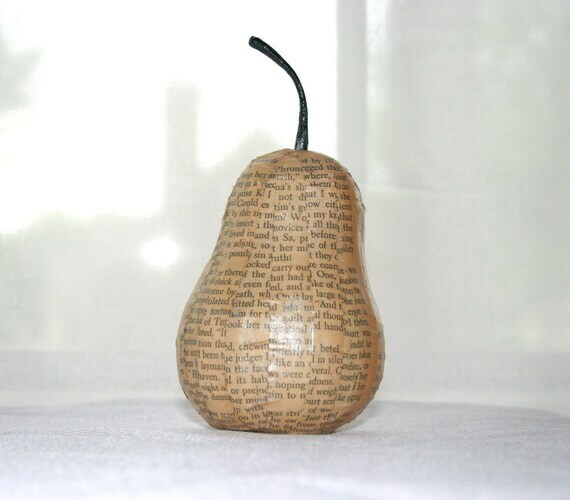 When I first purchased the paper mache' fruit, I think it sat in my "future use" storage for a few months. Which is actually pretty good, because the average is a couple years unless I am incredibly inspired about something. Sad, I know. But I have accepted that my inspiration for things can be very overwhelming since I see an idea or tweak in most everything around me. These fun fruits found their way onto my design table faster than most because I was working on cupcake gift boxes. I had a lot of extra glaze (a special mix I make) so I grabbed the fruit and some vintage paper and got to work. I have a method to my madness in covering pieces to enhance shape and form and the text from the book I am using, and it does take a lot more time than just slapping on pieces willy nilly. But willy nilly would work nicely too for those with a little less patience than me. I haven't made any in a while, but just looking at the photos again reminded me that there are a few more lonely fruits in storage....banana anyone?